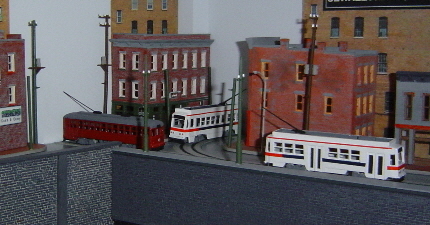 We've wandered a bit off the original topic here, but these are the "SEPTA" trolleys that are on my "East Tyrone" portable layout, They are actually constructed using a Japanese plastic kit of 4 tramcars (Greenmax, having looked it up..) containing 2 old style and 2 new style cars , that I bought secondhand a few years back. The 2 modern looking cars look rather like the Kawasaki built Philly trams, so were just converted to right hand running by moving the passenger doors and some other detail changes. One of the old ones was just painted up as a "preserved" car in a vaguely "Red Arrow Lines" livery. Not the best of pictures, but I havent extracted the layout from its resting place yet and these are the best I have on the computer at the moment! Have now finished off the last few low relief buildings for one particular corner of the new layout. Whilst the two smaller buldings are IHC "Homes of Yesterday & today" kits - purchased in Las Vegas 20 years ago, suitably chopped in half, the large one is a bit of cheating, as it actually a Kestrel kit for the UK market ! However, it is of a similar style (or rather, close enough) for some of the older eastern US cities. The horizontal window spacing is a bit close, but on other examples I have managed to squeeze in some shutters to make them a bit more "North American". Having now extracted the portable layout from its storage place, I have a few better photos of the trams, but will post those in the "Trams" thread, as that seems more relevant. Good job! Those Kestrel kits really have scrubbed up well! 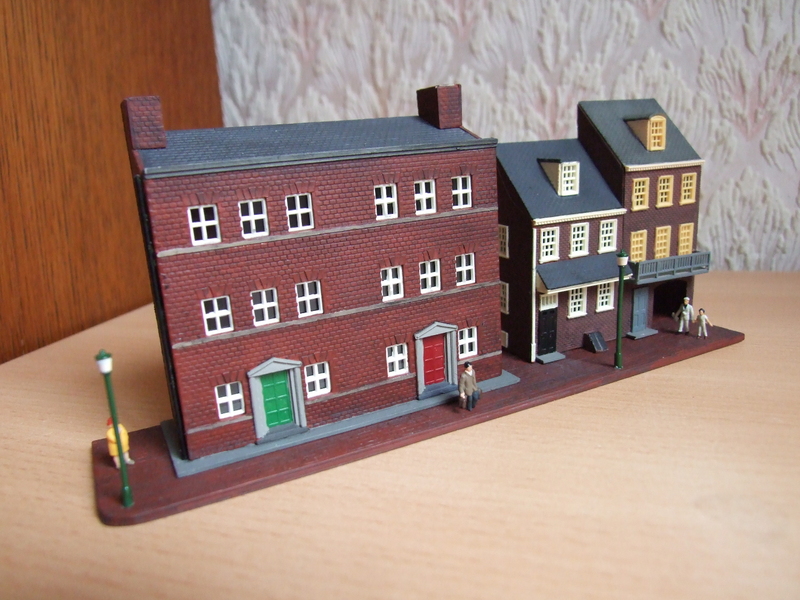 You mention cheating by using Kestrel kits to represent American houses but I'm using some DPM kits to represent British buildings! 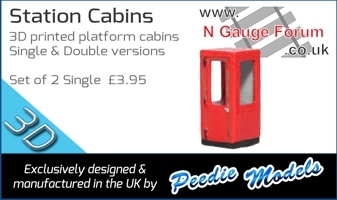 This isn't something that is new either, I know such conversions have appeared in the N Gauge Society magazine on occasions. Also, there is at least on 2mm finescale layout the heavily uses adapted American and continental kits to represent a slice of south London to great effect. The flash makes the colours somewhat brighter than they really are though. Not a vast amount of natural light in the room, not to mention the fact that my OO layout is above where I am working on the N layout, which doesn't help! Still lots more detailing to add as yet, and a building will end up occupying the stone base to the right of the picture. The tram is in line for a repaint as well at some stage, though I have already removed the trolley poles and fitted a home-made pantograph. 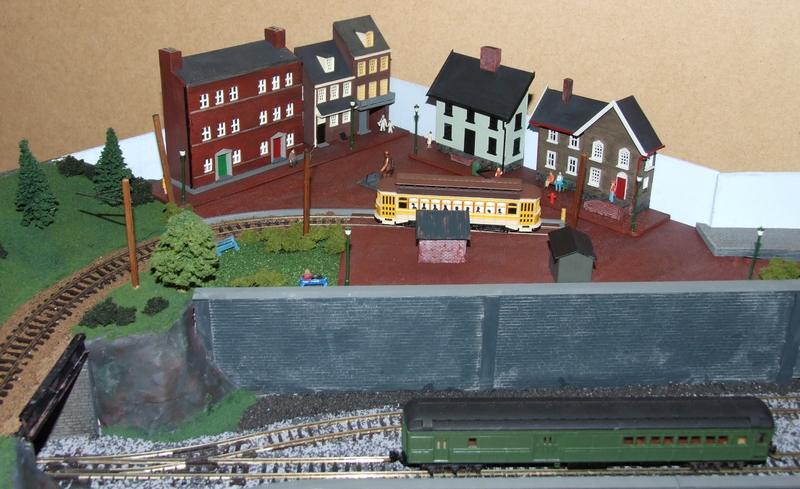 I'm going to start a seperate thread on the layout construction, most probably later today, so watch out or "Bredfield and Wrights Ferry" in that section! I've found that the flash on my camera tends to make things brighter than I like. I suggest turning off the flash and sticking the camera on a tripod or holding it as still as you can. You may get a better photographic effect. Worth a try. A couple more off the production line..........! These are for the Town centre end of the current baseboard being worked on. The hotel is a straight transplant from the previous layout - constructed from a DPM kit - though I have now mounted it on a suitable base for its new location. 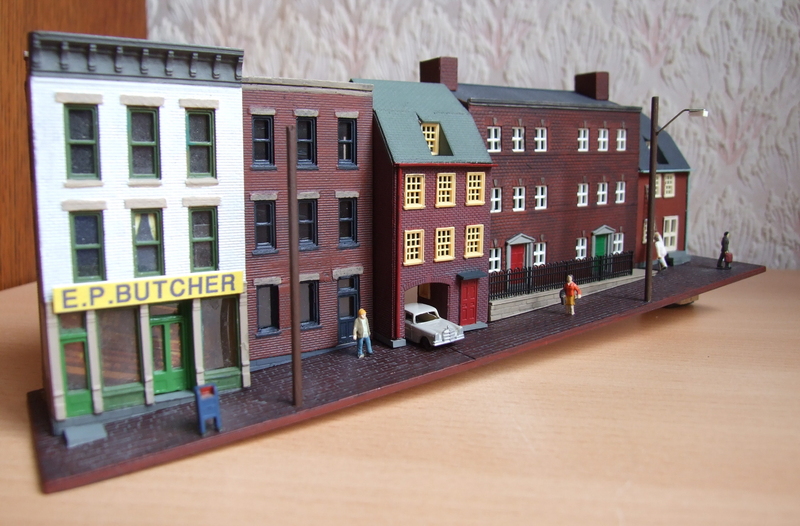 The low relief row of buildings are built from one DPM kit - the rear of the shop kit being used to make the tenement block next to it, and the other halves of the Kestrel & IHC buildings used in a previously illustrated project. All had to be "doctored" to fit the 1 in 11 gradient on the roadway at this point. You're a genius, sir. Love the buildings, and adapting them to the gradient is very impressive. 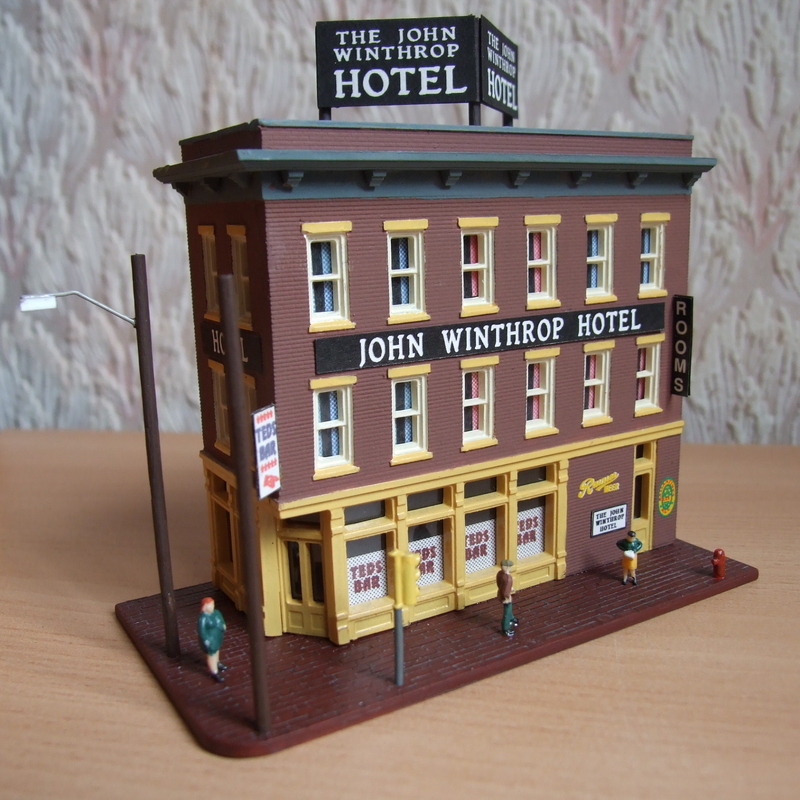 Mike, I love the John Winthrop Hotel especially. Do you know about Miller Engineering lighted signs? Some of them have to do with pubs and hotels and I reckon you could get some superb looking scenes with a bit of neon action enhancing what look to me like very nice building kits. Incidentally, I'm a bit puzzled how I seem to be called "Mike", as I don't think my name has been mentioned anywhere, but it isn't Mike (and neither is my surname Hunt....) - It's actually Steve! Steve , You'll be Steve from now on. Another "refresh" of a building off the previous layout which was then fitted to a base for its new location. 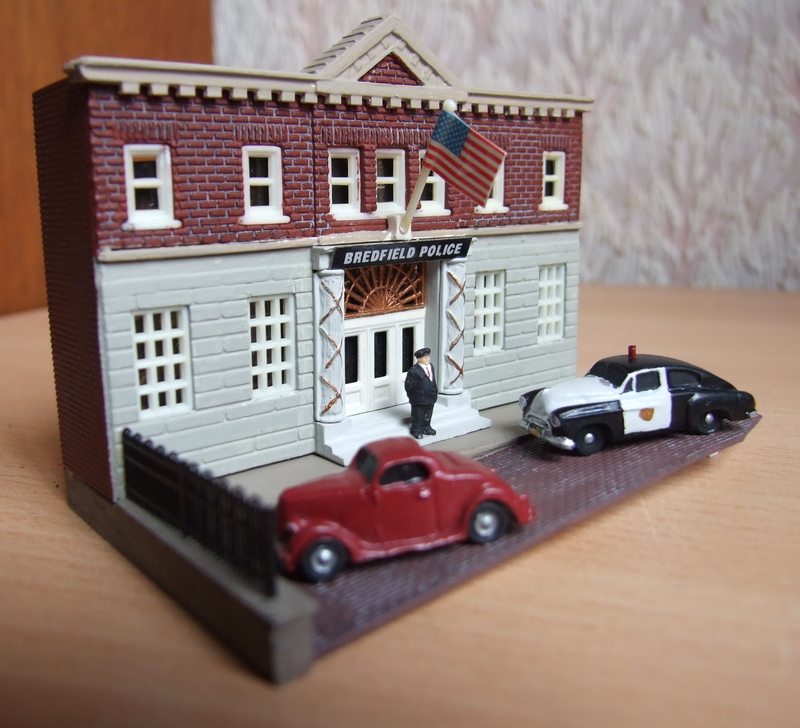 The police car is a resin kit of a '50 2-door Chevy with a bit of wire mounted into the roof to make the red light and then painted up in suitable colours. At least I found a figure in a suitable "E'vnin all" pose to stand outside the front doors! I managed to find three suitable arched windows in the spares box, the remainder of the building being constructed from some embossed plastic brick sheeting and a variety of plastic strip & sheet oddments, mainly left over from other projects. The spire is made from thin cardboard. 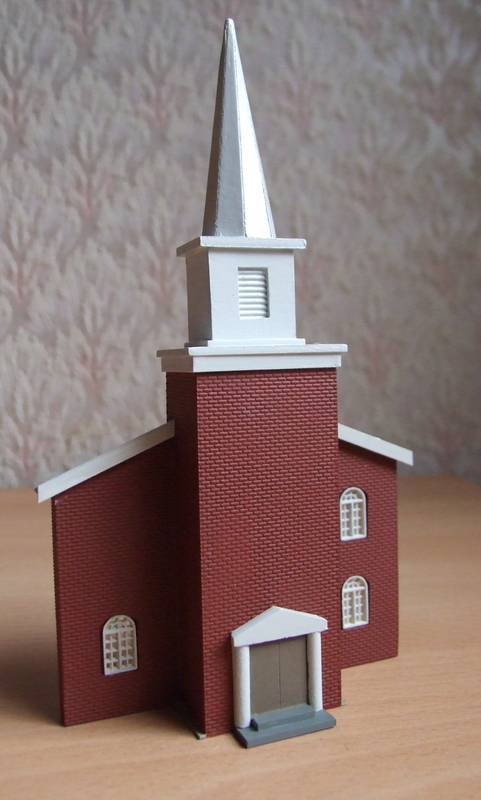 It's not based on any particular prototype, having made it as a generic Georgian style New England church, based on some I have photographed in the past. Some more minor detailing is required and it may gain a clock face on the tower at some point as well.